"...Ava Logan is an artist who deserves wider recognition because of her impressive classy style and unique blend of innovation and sound." "It is a delight to hear a good debut album by a performer who sounds like she must have made several of them previously... Her firm voice and hip phrasing make her a joy to hear..."
"There isn’t a note out of place on this CD... I hear Logan as a first-rate, accomplished popular singer with a swinging group behind her." "Ava is a joy to work with -- Great energy, a beautiful voice, and a total sweetheart. Luckily for me, she doesn't play piano!" "In her singing, Logan demonstrates a versatility reminiscent of the Fitzgerald style without actually copying her. " "...Such a beautiful, clear sound...lovely feeling..."
"...Ava Logan’s recording debut, but you’d never know it. Her voice is confident and distinct, deftly handling standards and rarities alike..."
"Smooth, sassy and classy all at once, this old school inspired diva knows the moves and how to hit the marks..."
"Ms. Logan gives a lot of spirit and swing to a set of veteran standards... she comes up with subtle ways to make the songs come alive, and the sound of her voice is very attractive." 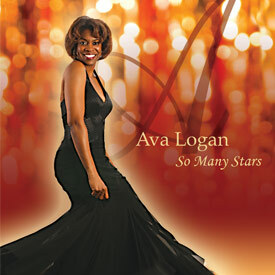 "Ava Logan offers a unique blend of innovation and presentation in her vocals – she is an artist to be watched." "Ava Logan offers a fresh breath of old-school glamour, bringing sass and swing to the classic jazz singer’s repertoire while retaining the swanky class that this material deserves." "...A lovely instrument – sweet and clear..."
"... I think your voice is terrific!...the quality of your voice is great, you really know how to swing!" "So Many Stars marks a sparkling debut for Chicago vocalist Ava Logan, who presents a delightful group of jazz standards, with an outstanding group of musicians behind her..."